Namche is always a little hard to describe. It is wonderful, stimulating, restful, and it seems to people that at least when we first return that everything that we need from Civilization is here. You can’t miss the point that Namche is a dusty, old fashion Asian trading town - much as it has been for centuries. I mentioned the Tibetans, they brought their yaks in, over the 19,000 feet Nangpa La from Tibet and they are crowded in the middle of the town. There are trekkers everywhere. We enjoyed going down in the middle of Namche. There are numbers of bakeries, with wonderful bake goods; some of them have outdoors seatings. I keep on mentioning the sun has been nice, we sit around - people watch. Everyone walked into town, including the Yaks. As I said before, there are no wheels in Namche, except the prayer wheels. It is a dusty, busy scene, a lot of tourists in town, far more than when we came through it. In addition to those baked goods and other attractions in Namche; there is what I call the Namche Big Three. Electric washer and dryers, flush toilets and the Internet. What more could you want from civilization after having trekked all the way up to the Khumbu Glacier? So, we have a lot to do today, we are going to stay busy around town, no doubt buying a few gifts and souvenirs to take home. Seeing many old friends and some new ones about town. And enjoying a Namche Bazaar day. I mentioned seeing friends in Namche, here at the Panorama Lodge. 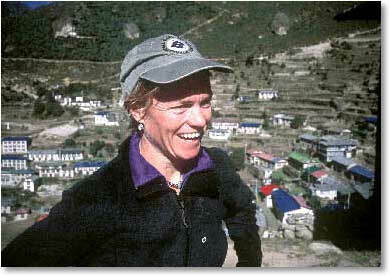 Frances Klatzel is also staying here; from Canmore, Alberta. 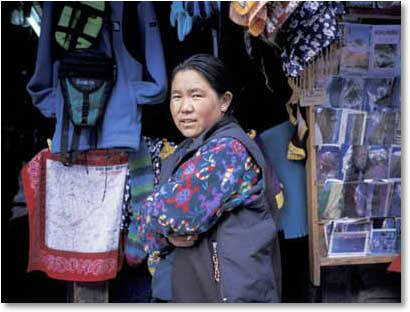 It is interesting because Frances book, Stories and Customs of the Sherpa people is required reading for my group. It is published in Nepal and one of the first things I told this group was to buy before coming to the Khumbu or when we get to Namche. It is a wonderful book, describing sherpa culture, sherpa budhist religion and monasteries and daily life in Khumbu. As I said it is required reading and we had the fun of having Frances and a group of Canadian trekkers shown up and stay here at the Panorama lodge with us. The Canadians were excited to see the “President’s Choice” herbal tea on our table that Pasang and his cook’s staff have served us direct from Canada. Francis signed everyone’s copies of Stories and Customs of the Sherpa People. Frances, as many of you know have lived in Nepal for years and years but was back home visiting in Canmore actually the same week as I was early in September, we both laughed as ours experience of being in Canmore when the bridge into town over the Bow River had been closed. We didn’t know one another were in town but we both related these experiences and laughing about circling around through Three Sisters Parkway every time we wanted to drive into Canmore. I mentioned the wonderful new displays at the National Park Museum above Namche in an earlier dispatch. These displays were done by Frances, and now, even thought they only went up last May, some open windows in the Museum through the Monsoon, has lead to mold on the back of displays. She is working to clean up the displays. Frances’ energy is amazing. Speaking of good friends at the Panorama, Meagan showed up again, still acclimatizing before she goes for her ski descent of Cholatse. Those of you who follow the skiing world know that Meagan has won the World Championship of Extreme Skiing each of the last 2 seasons. Two years ago in Alaska and last year in Chamonix, France. She is an exceptional athlete and mountaineer. She is going to go on Berg Adventures Everest expedition next year and will attempt a ski descent of Everest. Meagan and I have enjoyed sitting around here at the Panorama talking about our background and interest in climbing in the big mountains here in the Himalayas, especially Everest. We share in common a love for mountaineering adventures that we developed at an early age. Meagan and I explored the heroes of the 1963 Americans climbers that we read about when the National Geographic came around describing their ascent of 1963. We share a lot of adventures and mutual friends over the years and now looking in her eyes as she sees these big peaks around her and makes plans to follow her dreams to do the big ski descents in the Himalayas including Everest next year. We will see more of Meagan when we return for the Ama Dablam climb later this season.